Climate change presents an existential threat to modern civilisation. However, because its effects manifest over generational timescales, the present generation has limited incentive to address the threat. In the financial sector, institutional investors are becoming more aware of the risks presented by climate change, and more willing to take action. However, this awareness differs by geography, with relatively lower engagement with the issues in the Asia-Pacific region. 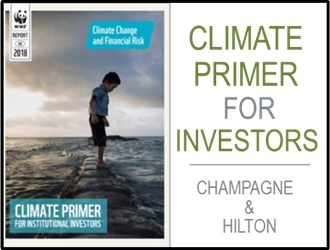 The Climate Primer for Institutional Investors is intended to provide an introduction to the basics of climate change with a focus on Asia-Pacific and the energy sector. 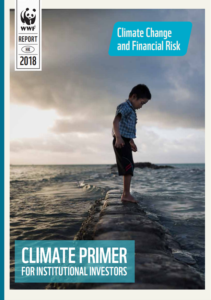 It provides an overview of the science of climate change, an articulation of the global policy response, a survey of technological approaches to the problem, and an outline of the various financial entities and resources involved in addressing the issue. The Earth’s atmosphere naturally traps a certain amount of solar radiation as heat via the greenhouse effect. Carbon dioxide (CO2) is the primary gas involved in the greenhouse effect, due in part to its extremely long life in the atmosphere. Other gases also play a role. By burning fossil fuels, humans have significantly increased the amount of carbon dioxide in the atmosphere. The higher levels of carbon dioxide have trapped more heat, raising average global land and ocean surface temperatures. The increased temperatures have numerous consequences that are already detectable. These include rising sea levels, changing weather patterns, reduced polar ice coverage and melting glaciers, higher frequency and/or intensity of extreme weather events, loss of crucial ecosystems, and increased oceanic acidity. All of these climate-related physical effects have risk implications for investors. Depending on their location, their portfolio investments may face higher levels of acute physical risk – these are mainly event-driven risks from extreme weather events such as typhoons, floods, or drought-related fires and may also affect their own operations. In addition, investors with longer-duration assets may be exposed to chronic physical risk. These unfold over timescales stretching from years to centuries, such as sea level rise or changing weather patterns. There are two primary policy paths to encouraging emissions reductions: market-based approaches and regulatory approaches. Market-based approaches are generally broader, and involve pricing carbon in some way, while regulatory approaches tend to be more sector-specific. Governments are using both approaches in their efforts to address climate change. This exposes investors to policy and regulatory risk, reputational risk and liability or litigation risk which can affect portfolio holding valuations. Responding to climate change ultimately takes the form of investments in adaptation and mitigation. This will require investments in human capabilities, communities, systems, and, most importantly, technology. This presents opportunities for investors. Initial efforts to mitigate climate change have focused on the energy sector, which comprises almost 70% of global emissions. Compared to adaptation, mitigation offers a wider range of investment opportunities and vehicles compatible with current investment processes, especially for investors who focus on secondary market instruments such as listed equities. Asset owners and managers who are able to provide direct investment or debt finance in particular are less limited in their investment options, as across both the mitigation and adaptation spaces, market rate debt via project or corporate finance is the primary form of project funding. 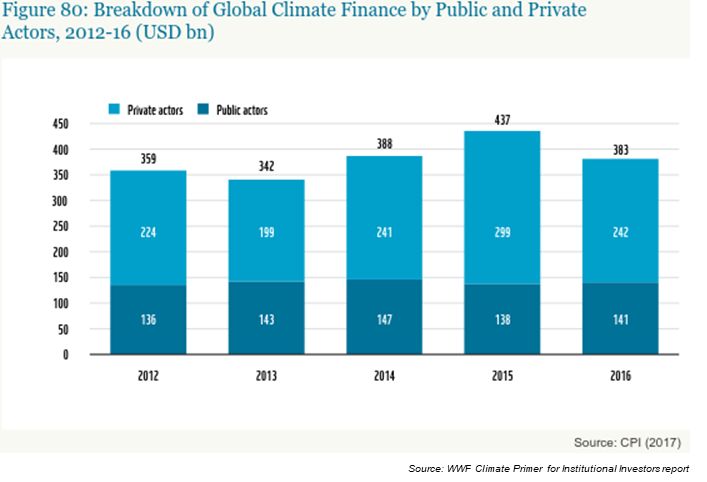 Climate finance flows originate ultimately from public or private sources. On the public side are governments and various public financial intermediaries, while the private side includes corporates, households, project developers, and private financial intermediaries. Public finance is a crucial player in addressing climate change, in particular by getting the private sector to focus a portion of its far-larger resource base on the problem. In combination with the appropriate policies and regulatory environment, public finance can help stimulate and direct flows of private capital by demonstrating feasibility, creating markets, fostering innovation, and reducing risk. The private finance ecosystem can address climate change both directly and indirectly. Banks and project developers are the predominant source of private direct financing of mitigation, with traditional institutional investors playing a smaller role. This is because the financial system tends to focus on more mature sectors with relatively high funding needs. This does not match up well with the comparative newness of the various technologies and business models involved in delivering climate investment, nor with the limited scale of many projects. As a result, indirect investment via equity or debt securities is the primary channel through which most institutional investors will be able to deploy capital to address climate change. However, this does not mean they are helpless in the face of the problem. Institutional investors need to integrate climate change issues into their operations and investment processes. Ideally, this would be driven from the top – with the board level establishing the asset owner’s climate-related beliefs, policies and targets, and communicating them down the organisation. For asset managers, such integration is partially about client service – asset owners with climate processes will likely have a preference for engaging asset managers with complementary capabilities. Investors should make use of existing and emerging tools to assess the climate risk their portfolios contain, a task that will become easier as climate-related disclosure improves. From there, they can determine how to mitigate this risk, whether through portfolio decarbonisation, corporate engagement, or other methods. Although the policy and regulatory environment with respect to climate change is constantly shifting, the direction of travel seems clear. Institutional investors are in the process of coming to grips with the risks involved. Jean-Marc worked for 17 years in the investment banking industry for Merrill Lynch in New York City in equities, Bank SinoPac, BNP Paribas and Jefferies in Hong Kong in equities and equity derivatives. Jean-Marc was most recently at Jefferies and left in mid-2015 as a Senior Vice President, Equity Derivative Sales to join WWF to make a proper contribution to society and the world. Jean-Marc is the Climate Finance Advisor for WWF-Hong Kong and advises institutional investors on the financial risks related to climate change. Sam Hilton is a Senior Research Analyst for Environmental Finance at WWF-Hong Kong. He was previously an equity research analyst at Keefe Bruyette & Woods and FoxPitt, Kelton (acquired by Macquarie) in Hong Kong, where he covered banks, brokers, and exchanges across the Asia-Pacific region.